The Regal Marine Industry was founded by Paul and Carol Kuck in 1969. Nowadays, Regal shipyard designates trendsetting expertise and mastery. Their philosophy arouses the sense of adventure which magically appears within and behind their crafts during the ride. Furthermore, Regal industry embraces ardent specialists who are at the sole core of the company’s success. Considering their perpetual development, they have come to the highest standards, and bystanders and customers started worshipping their vessels due to the valuable essence of their craftsmanship. Regal’s asset LIFECore construction process enables their architects to identify and pinpoint the explicit areas for aluminum, fiberglass and materials leading to the reduction of stress and upgrade of craft’s durability. 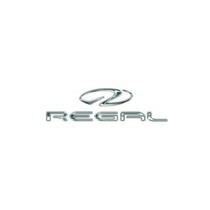 During their efforts, Regal has come up with Regal 27 FasDeck. This enchanter is reminiscent of a luxurious Italian sports boats. 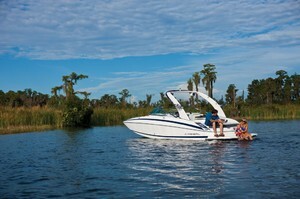 Moreover, she is a perfect synthesis of wake boats and a family fun boat. She possesses stunning miscellaneous features marking her as a high-priority vessel on the world market. 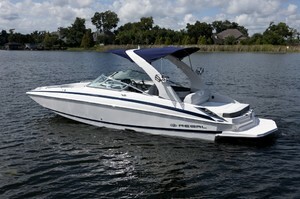 Here is the Regal 27 FasDeck's review. Let’s dig deeper into the Regal 27 FasDeck's layout. The overall length of the Regal 27 FasDeck is 27 feet and 3 inches, while her beam stretches to 8 feet and 6 inches. Her demeanor is highlighted with the sporty lines and one can always tell a regal from miles away just by the lines. Regal does all their colors in a gel which is an outstanding detail. Looking from a distance, one can notice the proximity of the swim platform to the water for easy boarding. Her sleek display astonishes onlookers and attracts mariners' attention. With her dry weight of approximately 5460 pounds, she has miscellaneous alternatives with reference to the engines, ergo performance. Two motor models are purchasable including Merc engines with a range from 300 to 380 horsepower and Volvo sterndrives with the same scope of power and strength. 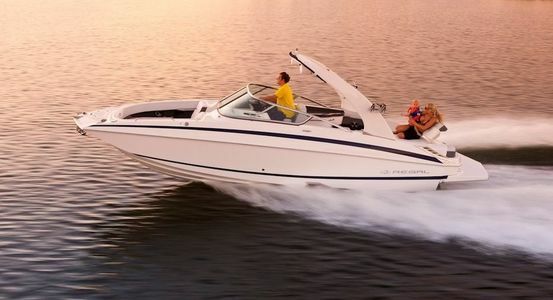 For instance, with Volvo Penta 300 horsepower engine, the maximum speed is roughly around 47 miles per hour, averaging a fuel burn of around 23 GPH (gallons per hour), and the best cruising speed is close to 23 miles per hour measuring a fuel burn around 8.65 GPH. The handling of this vessel is pretty much commendable. 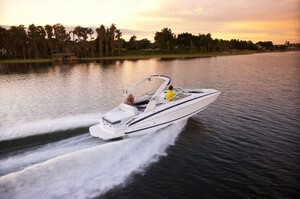 The steering of the boat goes smoothly and safely with the absence of tossing the passengers around the craft. 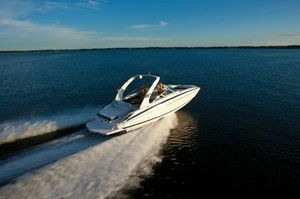 The Regal 27 FasDeck behaves very well and with the prompt response to the engine control. While speeding up, the visibility to the horizon is more than satisfactory. Further, she is rock solid and stable and gives a memorable ride. 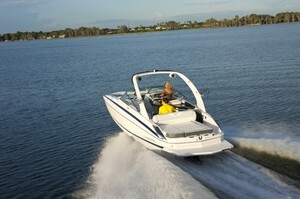 Additionally, Regal FasTrack hull design is out of this world and superbly compliments the rest of the qualities. A full-beam step minimizes surface tension leading to the reduction of drag and friction, increased speed, and assists with control and decreases the fuel consumption. Commencing from the stern, one notices an impressive vast swim platform which is constructed in a cunning V-shape displaying a sporty demeanor. Outdrive is deeply tucked underneath the platform, therefore, swimmers’ safety always comes first. The ladder is installed to the starboard while the handy grab handle is placed to the transom. A ski tow pylon pops up with just one press, and can be pushed right back down if one does not need it. Brake lights on the transom enhance the safety. 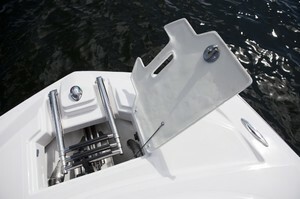 The transom is also furnished with a mounting bracket for an optional table. The ground-breaking lounge is certainly on steroids. Its versatility and miscellaneous features are out of this world. Dwelling on this sun pad gives a cloud 9 feeling. Why is that? First of all, it is highly convertible and transformable. Embracing not three or four, but five positions, it provides multiple options for relaxation. People can sit facing forward or vice versa, facing aft. Then, one can lie with a pillow pad or completely flat using it as a day/tanning bed. Chaise lounge position is also an option. The aforementioned table on the transom now really makes sense. Parents can eat snacks or drink refreshments while their kids are swimming in the back. Characteristically, it has storage underneath leading all up to the head which presents a huge storage space. This ultra lounge is equipped with King StarBoard and stainless hardware. The cockpit of the Regal 27 FasDeck is impressive as well, featuring different assets and boasting various gadgets. Straight on the starboard side is an optional refreshment center. This center can be used for laying drinks or snacks. It also encompasses a convenient trashcan and a sink. It is simply an all-around space that can be pretty useful. However, it can be either a refreshment center or a seat facing other arena seating. The other seating display comprises a lounger to port and goes around to a bench seat. This bench is a part of the aforesaid ultra lounge. This portside lounger is commodious and appealing. Underneath the lounger is a depository for a carry-on cooler. Unquestionably, the Regal 27 FasDeck does not lack storage space at all. The helm is bestowed with a hand-stitched, vinyl-wrapped dash exhibiting elegance of the boat. The gauges are black with the gunmetal gray nuances. The gauges are practical showing fuel, oil, temperature, miles per hour, RPM’s with digital hour meter right inside and a trim gauge. 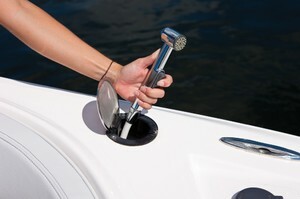 Standard equipment also includes a depth sounder installed to port and toggle switches are lit and waterproof. Regal puts majestic Fusion Stereo Systems in their boats. The system is convenient due to the integrated part which allows connection of Apple’s iPads or iPhones for that matter. Therefore, connect your device to the appropriate sleeve and it gets automatically connected and it’s good to go. The device is protected since the sleeve is inside the console. The steering wheel is a tilt one allowing the skipper to adjust it according to his needs. The skipper’s Regal seat has a flip up bolster. The seats are made of 38 oz vinyl which keeps the new appearance even after 10 or 20 years. Starboard bulkhead possesses the activating pressure switch for the 12-gallon water tank. Ergonomics of the helm is at the sole pinnacle and visibility is more than adequate. 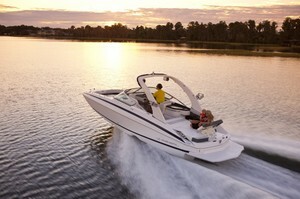 The Power Tower is a valuable edge for the Regal 27 FasDeck serving as a wake/ski tower. It is basically a well-made tower that can be electrically lowered with just one press of a button positioned at the helm. It enables much more space for watersports equipment. Tow eye, blue courtesy lights, and speakers turn on the fun factor all at once. There are some precious optional assets like RegalVue display which supports monitoring of sundry parameters and a moving map display is integrated too. The head compartment is situated on the port side of the helm and is spacious in all respects. A clean-cut, cherry wood veneer occupies the head along with the stainless sink, plenty of foot room, mirrored doors, and an opening portlight. There are some options available like pump-out fittings or even macerating head with pump-out. Concerning the bow, it is really exceedingly big. It can accommodate four or even five people and provides space for stretching legs on both sides. Armrests can flip up and flip down depending on the current needs and give that extra touch and comfort. Up at the front, a forward boarding ladder is neatly integrated and is yet another great feature by Regal. The boarding ladder just flips down and telescopes down for re-boarding. The ladder is set upon the anchor. The storage issue is phenomenal at the bow. The starboard seat lifts up and one gets an immense storage area. This storage area actually goes all the way back to the skipper’s feet. This storage can also be accessed via the seatback and even from the side of the console. The port seat also comprises storage space. These areas are so vast that they guarantee enough space for different equipment. 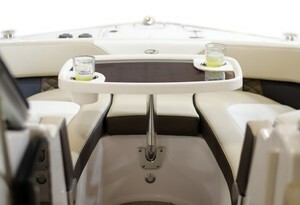 Optional bow features include a bow table since there is a base mount at the bow. Furthermore, anchor windlass and a bow shower are nice optional utilities. The elective anchor dwells underneath the bow hatch and can be used without moving the ladder. The engine compartment is underneath the bench seat which allows convenient access. More than enough room is available for periodic engine checkups. Regal engineers thought about everything, hence, if some substantial maintenance is obligatory, one can remove the side bulkheads. Other optional equipment encompasses a washdown, TV/DVD, carpet in the cockpit, transom shower, cockpit cover, bow walk through doors, docking lights, underwater lighting, dual battery switch, gas vapor detector and much more. The Regal 27 FasDeck's price increases with these optional gadgets, however, it’s worth every nickel. The Regal 27 FasDeck is a superb watercraft for miscellaneous activities ranging from water sports to cordial family moments. She has a lot to offer and more with her different features from the bow to the stern. She will captivate you in a second, so waste no time and contact us now and get your own 27 FasDeck. You will not be disappointed!